I would be a lousy scientist. I don’t like to experiment – I like to execute ideas perfectly the first time. This, of course, has never happened but I just know I would like it more. 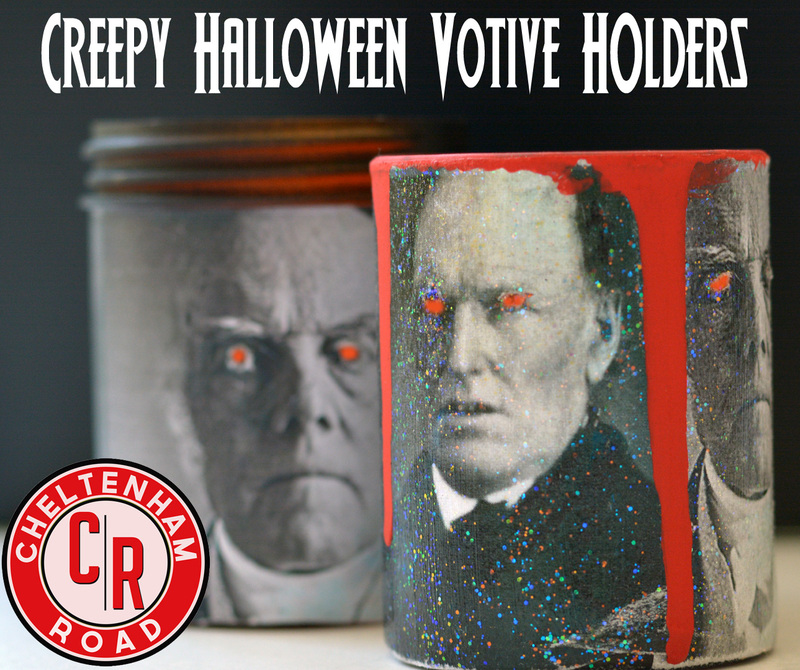 My spooky tealight holders took a lot of experimenting. I tried small jars (too small!). As we know, I took a brief ill-advised, foray into glitter (too…ponies and unicorns!) I tried mason jars (too – “hey that’s a mason jar”). I tried using velum for the images (too – um, the toner slides off when you try to mod podge it). It all made me too – cranky! But I kept at it and refined it a bit and I think I’m ready to present my final take on making spooky glowing eyed candle holders. They are actually very easy to make but, for some reason, kind of wordy to explain so hang in there. Glass Candle Holders or jars (can you see them? sorry. glass! hard to photograph). Mine are from Dollar Tree. I used only straight sided holders and looked for a variety of heights and shapes. Spray Paint. I used black, grey and some window frosting paint I had lying around. Any color that appealed would do – the cheap stuff is perfect. Rag: the more texture on it the better. It probably won’t survive the process so don’t get too attached. I looked for distinct faces and prominent eyes. The larger the eyes are to begin with the easier this process is and the better the results. Also, while a whole crowd of glowing eyed spooks sounds awesome – it gets less a lot less awesome as you sit there cutting out tons of little tiny holes. I learned to stick with pics that featured one or two people. After downloading my faves I resized them to suit my candle holder dimensions and printed them out on plain paper. This part has to be done pretty fast before the spray paint dries. Working with one candle holder at a time spray the top and bottom pretty thoroughly but just let the over-spray take care of covering the middle (it makes life easier and less messy down the road). The moment your done spraying wrap the candle holder in the rag pressing it into the paint with your hands. 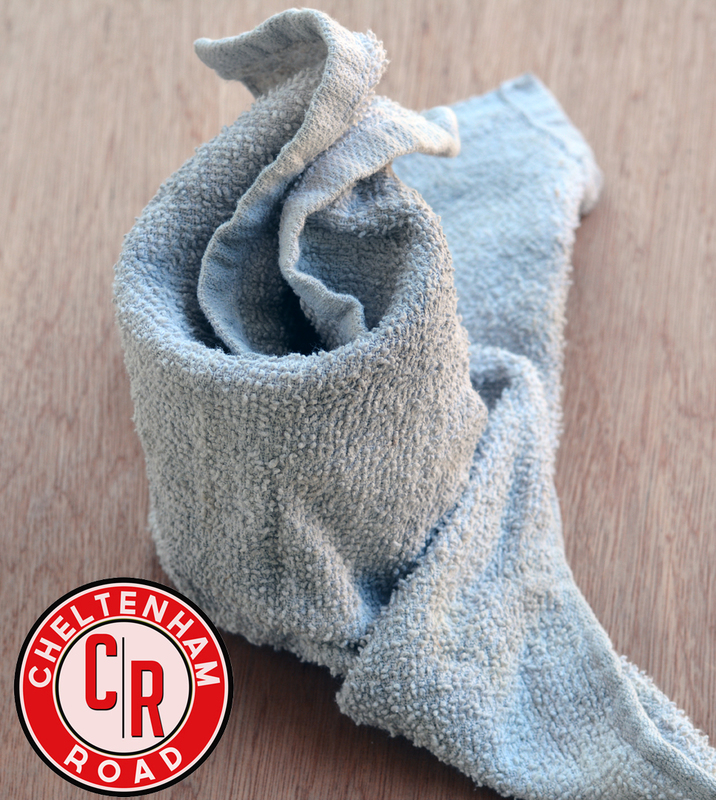 Give it just a second or two and then remove the rag. You’ll have a nice, decrepit texture. Using the same rag repeat that process with as many candle holders as you want in as many colors as you want. 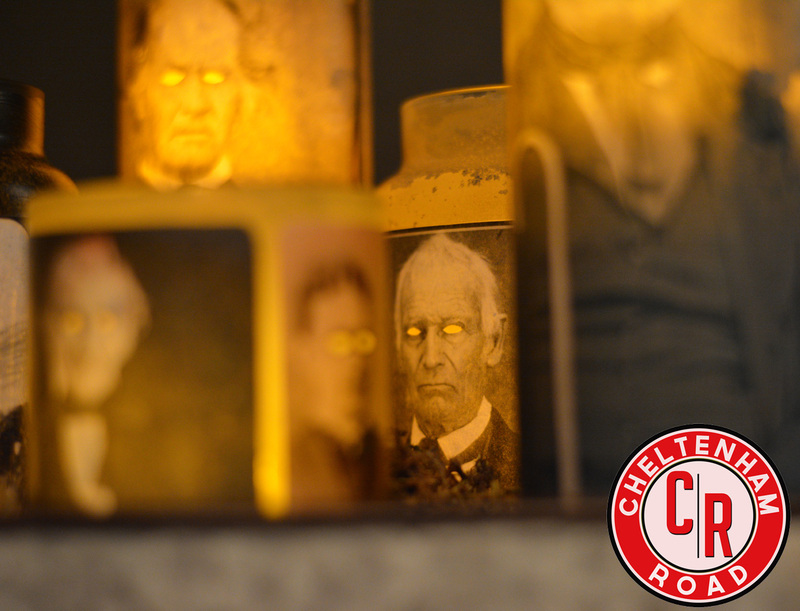 While the candle holders finish drying take a craft knife and cut out everybody’s eyes! (upsetting sentence #1). 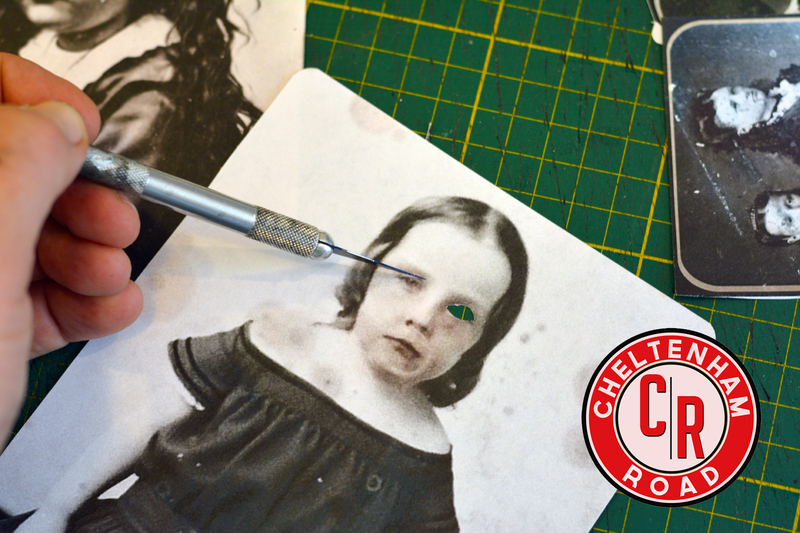 I learned to go a bit wider than the subjects actual eyes – removing the whole eye socket is best (upsetting sentence #2). In my first attempt at these I painted the whole candle holder solid black and then just scraped away where they eyes went. Result? Glowing eyes but, when the lights were dimmed that was all you could really see – the faces disappeared. So, in order to get the whole face to glow a bit along with the eyes I found that if I painted the middle lightly and then, using sandpaper, scraped away some more paint it worked out great. I didn’t sand away every trace – just most of what was there. 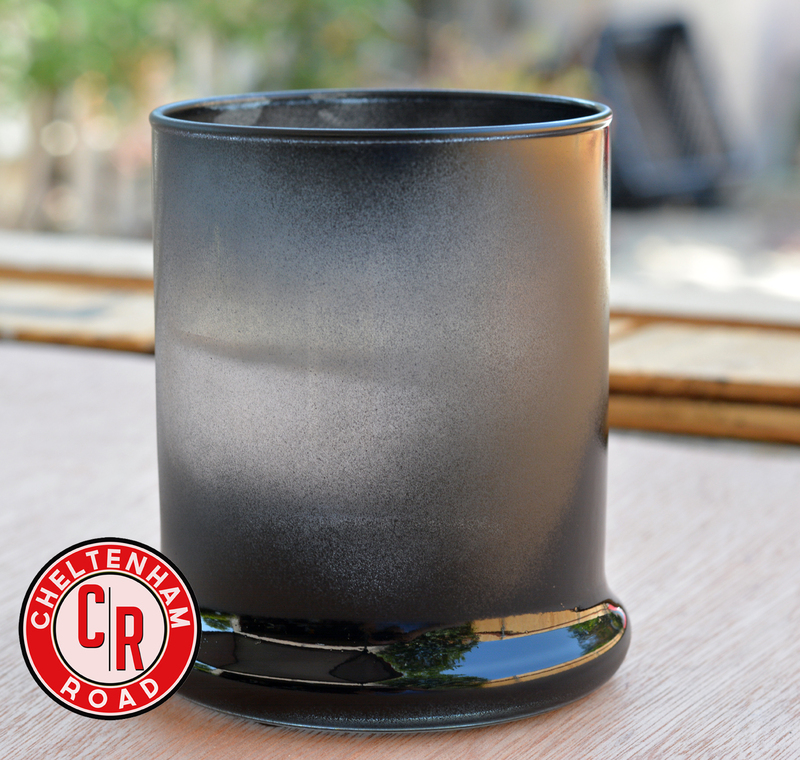 The streaks that remain add some nice dark spots when the candle is turned on. 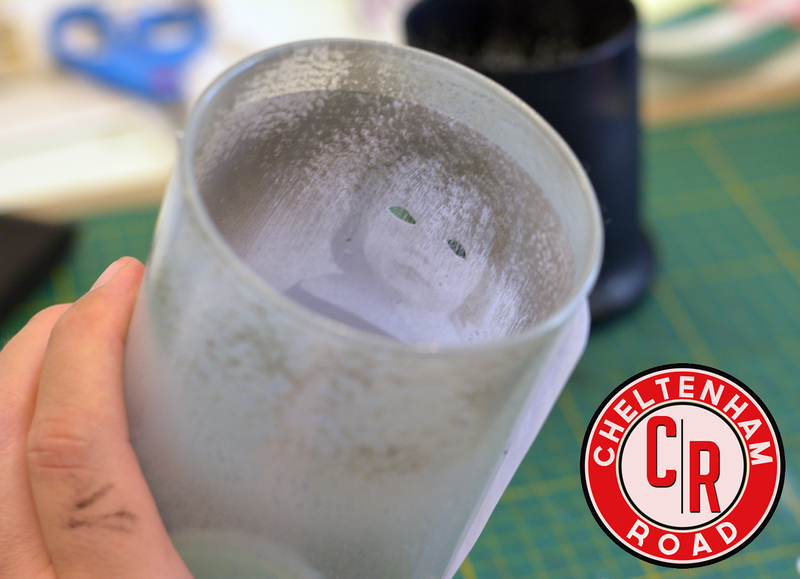 A quick dry-check to make sure I sanded the right spot and it’s time for Mod Podging the pic in place to the outside of the candle holder. I applied one image at a time working my way around the candle holder, smoothing out the image and wiping away any excess Mod Podge. Once everything dried I added a sealing coat of Mod Podge. I then went back in with my craft knife and scraped away around the eyes one last time for extra glowiness. I think they make their case in regular light. They’d look good as a center-piece or on a mantle. But dim the lights a bit and let the spooky really kick in You can see how the textured paint allows some of the light through both behind and under the pictures. I discovered it was best to get the light up to eye level so for taller candle holders so I used a chunk of wood, a dowel or even a plastic cup to elevate the electric tealight. Someone at Scare LA suggested that, rather than old pics, you could use pics of ex boyfriends, or your mother-in-law. Mean! but funny! I hope this is helpful. If I’ve left anything too vague let me know and I’ll address it. David, you are my favorite blogger! I wonder how these would look with some demonic animals instead of people? That’s a great idea that never would have occurred to me. Thanks! So creepily fun (and perfect for my 12 year old son to make). Would it be weird creepy if I used a photo of my great grandparents? (fortunately/unfortunately they look very dour). I guess all these people are probably somebody’s great grandparents so I so go for it! Love these!! So unique. I can’t wait to make this the next (bonding, memory making, yes you have to, you know you love it) craft project with my grandchildren. Off to Dollar Tree. Thanks so much for sharing the tutorial! perfect! please send pics if you do – would love to see other people’s take on them. Happy bonding! perfectly morbid and creepy–love it! These are so awesome…can’t wait to try it! Thanks for the great tutorial, too! I can’t quit laughing…at your humor. Obviously, you didn’t get the “grace” gene either (me too! maybe way back we’re related 🙂 I’ve got stories of my “experiences” working at the law firm…. Thanks for brightening my day, and giving a tutorial for the spooky candles. Very very cool and so well explained how to make them. So….. For those of without time/talent/time (did I mention time? ), will these be available for purchase from your Etsy Store? I’m afraid I’m not keen on the challenge of shipping glass so, for the moment at least, they are a locals only thing. If only you lived nearby……. David, these are so amazing! Thanks for the tutorial! Just wondering… why are these only ok for battery operated light? Is it because some paint got inside the candle jar and it is flammable? So glad you like them Sarah! I’m probably just erring on the side of caution with regards to the electric tealights. Since Mod Podge (the adhesive I used to hold the images in place and seal them) is, basically, a form of glue my concern was that if the actual flame heated up the glass you ran the risk of the Mod Podge melting a bit. 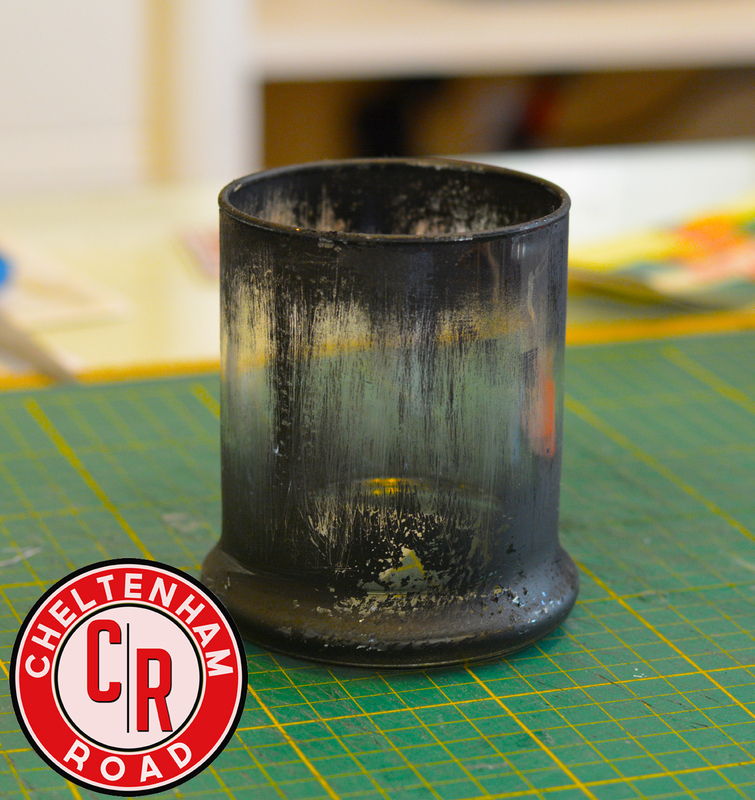 Also, as you mentioned, it’s almost impossible not to get some paint on the inside of the candle holder – I have no idea if the heated up fumes would be particularly toxic (it certainly would be a very small amount if so) but figured why take the chance. Hope that helps! I think this is the best tutorial I’ve ever read! Plus the candled look great! Thanks so much Paula! If you make some send a pic. I love to see what people do. Thanks so much Kristen. If you have any questions as you go along don’t hesitate to ask. And when you make them send pics! I’d love to see your version. Hi David! I’m Eva from Barcelona and I found an awesome idea your Halloween Candles! 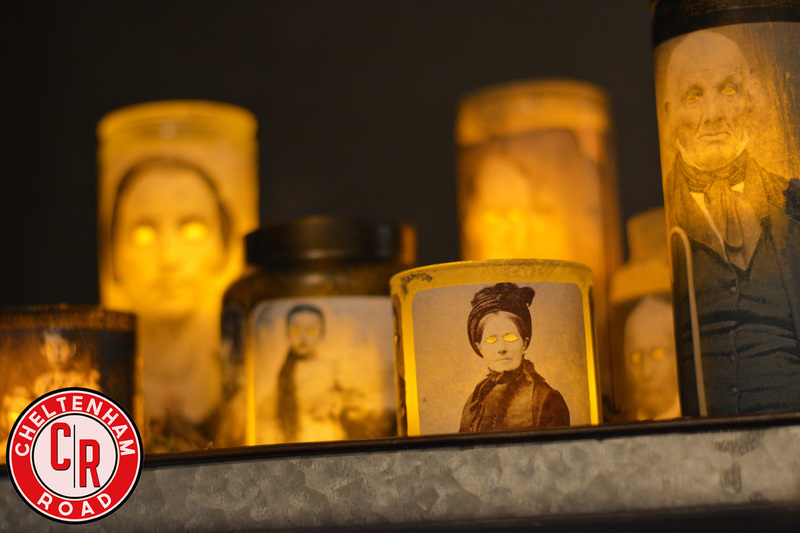 Last year I made a few Jack’o’lantern candles but this year I would like to try the creepy victorian one. You have made an excellent work, thank you very much for inspiring me! Just a couple of questions, about the modge podge, I have super Podge gloss at home, it would be useful as well? And once that the photographs are pasted, should I cover them with podge? Best regards from Barcelona! HI Eva! I’m so glad you like the project idea. Any version of Mod Podge should work. With the glossy version you’ll just get a bit more shine on the final project (which would be fine and might actually be better now that I think about it). And yes, once the pictures are attached and dry I do a final coat of Mod Podge to seal them (just for durability). Again, any Mod Podge formula would work for the seal. Hope that helps but don’t hesitate to ask if you have any other questions. 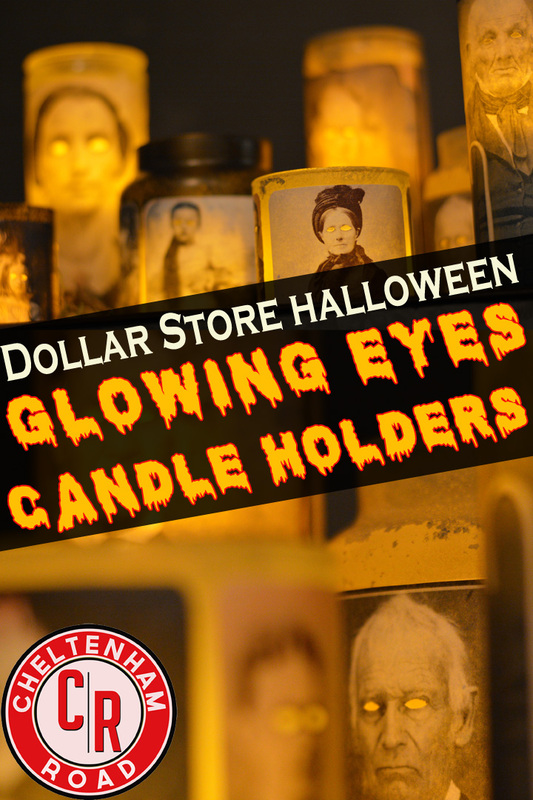 Have a great Halloween season and if you make the candles send some pics! What a fun idea!! And thank you for the details! I hate finding a cool project with details missing! Oh, and thanks for making me laugh out loud! I’m looking for pics right now and there are some super creepy ones out there! Thanks Heather. I actually used creepy,old black an white photos of clowns on the ones I did this year! Freaked myself out. If you make any please send pics! Ohh, that sounds majorly creepy. Well done! I’m so glad you made some. 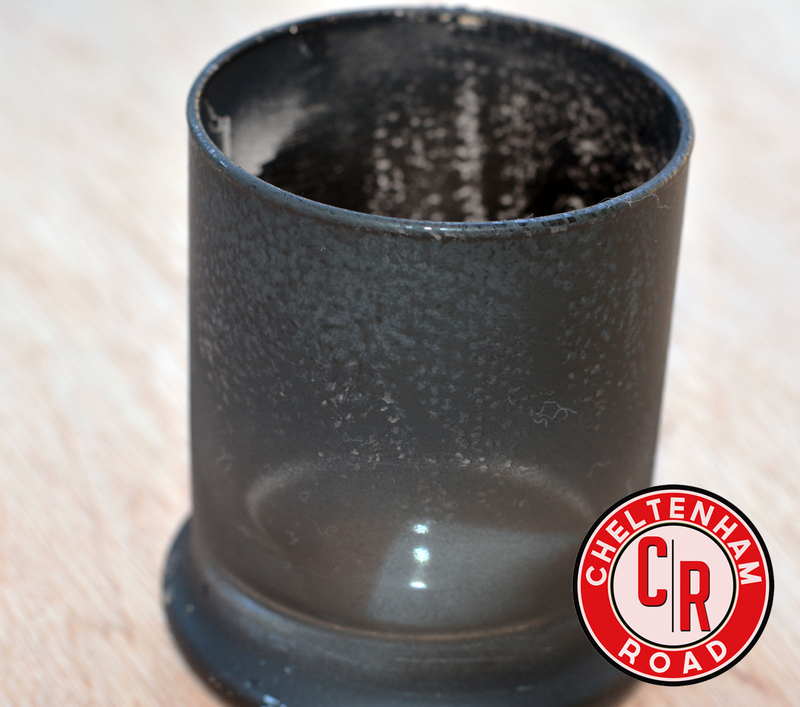 If you have any time send some pics to my email (david@cheltenhamroad.com) I’d love to see what you’ve done. Hello. LOVE this idea. I know you said you used a laser printer but what kind of paper did you use We tired it and used just regular printer paper but the images were too translucent. Hi Julie. Good question and I’m sorry you’re having trouble. I’m not well versed in the various brands/weights of paper etc. I use the basic, Staples brand for laser printers. I don’t know if it’s particularly thicker than other brands. These came out amazing! Can’t wait to try! Thanks Nancy! If you make some please send pictures. I love to see what other folks do with the idea. It looks as though you put the pictures on the outside of the jars. Wouldn’t they have looked better with them on the inside (seeing you’re using electric candles)? Just a thought. These are great, & the instructions are perfectly clear. Now, me & my kids have a cool craft to get started on!! Thanks so much! And that’s genius about the sand and such -wish I’d thought of that. I hope you do make some and, if so, please send pics! I can’t wait to try this….LOVE IT!! 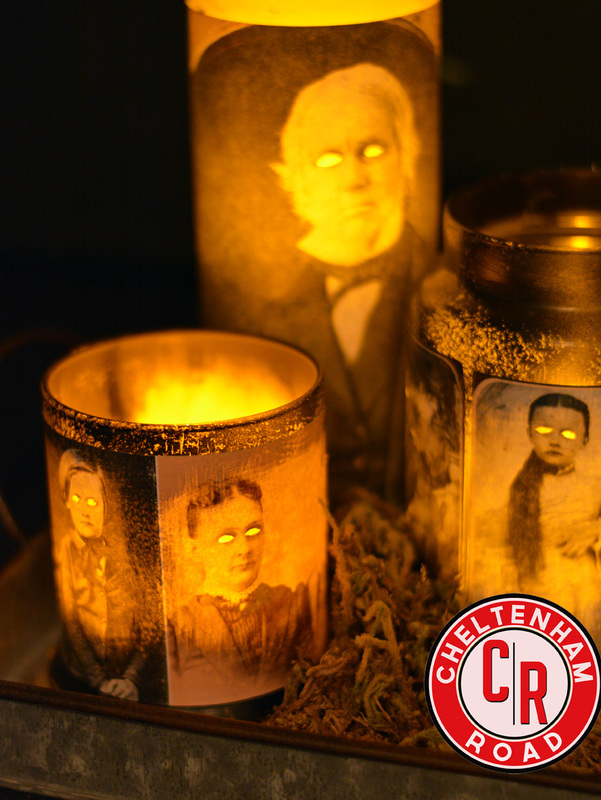 I love these votives! Thank you for sharing. I’ve never used modge podge so I’m looking forward to trying this. Do you put the modge podge under the photos and then put them on the glass, also modge podge over them? Thanks Becky. I drop the picture (printed on a toner based printer) in a dish of water (it helps relax the fibers of the paper so it goes on more smoothly) for just a few seconds. 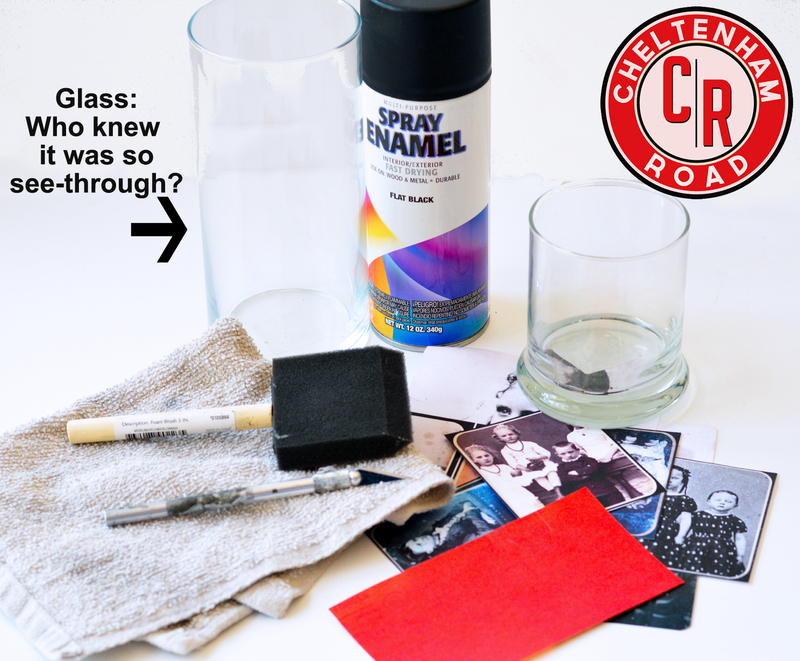 While the pic soaks, using a foam brush, I brush the Mod Podge onto the glass. I then take the picture out of the water, gently shake off any excess water and then smooth it in place onto the glass. After it’s dried I then seal the whole thing with some more Mod Podge for a little extra protection. Hope that helps! Are the images glued on inside or outside of glass? Hi Martha. 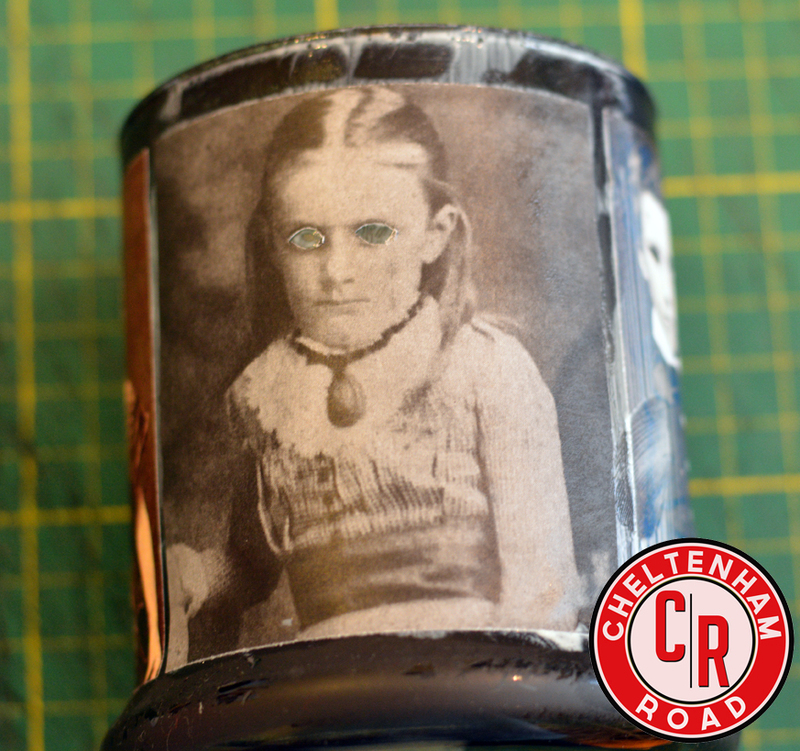 I glue the images to the outside of the jar. You’re the second person that’s asked that. I apologize that it’s not clear – I’ll go back in and modify the tutorial. Thank you for bringing it to my attention. These are absolutely amazing! I don’t know how I’ll ever decide between all of these spectacular Daguerreotypes. I do have a question though: Have you tried to use real candles? What happens? Thanks Katherine! I have never tried actual candles. 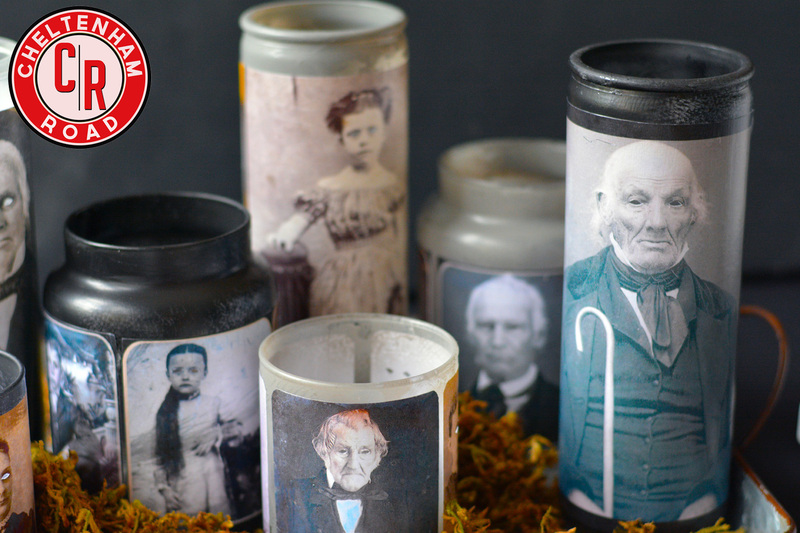 I’m probably over cautious but because I use Mod Podge Decoupage medium to attach the images and I’m concerned that the heat generated by a candle might make it get melty. Thanks for the speedy reply! If I try real candles, I’ll let you know what happens. Your efforts were well worth it. I love these! They will look really awesome in my old house this Halloween. I love these! I wish you sold them – I would buy a few! Thanks Jessica! I hesitate because I don’t really want to deal with shipping glass all over the country. However, I am making a few for local stores this year so if would truly like some drop me a line and we’ll work it out. I just found this idea and I think it’s great. I already have a picture in mind too..It’s my very German Paternal grandparents and their mini mes- toddler versions of my dad and aunt, who looked remarkably like them when they were adults. Probably circa 1907-ish and very serious faces. I think my older brother will love it. Since I’m now in my 60’s plan on leaving this tutorial to my great nieces and nephews and pictures of their grandparents and me in hopes of starting a Halloween tradition. Should be great fun! Thank you! HA! What an awesome and funny idea! I hope the nieces and nephews take you up on it! (also, spelling your name wrong makes you my ideal reader! I seem to have a unique knack for NEVER spelling anything correctly). Thanks so much for swinging by!